For Sandie Acosta, running marathons wasn’t just a way to help keep her body healthy, it was a way to remember the loved ones she lost to cancer. In 2012, the now 52-year-old lost her mother to a long battle with cancer while her father struggled for his own life under the same disease. Just 10 months after losing her mother, her father died from cancer. The same year of her dad’s passing, Acosta’s son J.J. died from complications with cancer. He was only 21 years old. With time and endurance on her side, Acosta embarked on challenging herself as a way to distract her heavy heart and mind, and a way to better herself within her running community. Acosta now runs marathons in remembrance of those she lost and those she wishes to inspire through her own journey. Q: Where’s your favorite place to run in the RGV and why? A: I enjoy running at SPI simply because it is place where I can see as far as the water meets with the sky and be able to admire the true beauty of Nature. The SPI scenery allows me to enjoy the sun rise and the sea breeze whispering while I’m running. Q: What’s the largest or most special running event you participated in? 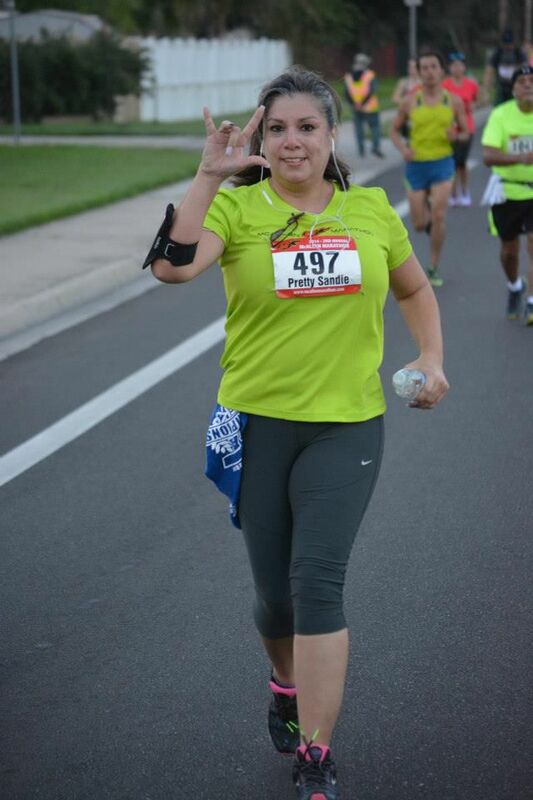 A: The largest run, which was my most special run, was when I completed my first full marathon at the SPI 2015. This marathon allowed me to assess my endurance on a much longer running course and also provided more time for me to reflect on my Life and remember my son, JJ. It was quite an amazing running experience even when there were just a few participants still running toward the finish-line. Q: Do you have a cause your run marathons for? A: Breast cancer, diabetes, etc. The cause of my Runs is usually for Cancer and/or for any fundraiser toward medical needs for an individual/family. A: My motivations toward training is simply that by practicing will only allow to acquire the endurance to stay healthy throughout the runs, especially when it’s a much longer run. A: The advice that I usually recommend is that ‘The biggest step in running is to start walking, jogging, or running. Once s/he gets themselves out there … with time, it will become easier. Join a running-group; go with a friend to a running event or to start walking to improve his/her health. A: I will be participating in the McAllen Marathon in January in memory of Scott Crane. A: I have been diagnosed with Rheumatoid-Arthritis, Osteo-Arthritis, Fibromyalgia and I used to get constant migraine headaches, which doctors would usually recommend all these medications. Well, since I started running and staying more active, the stress and pain on my body has lowered and I take fewer medications than before, which I have also lost so much weight. Running has helped me emotionally and allows me to face each day as a Blessing. Although I miss my son, JJ, running keeps me feeling positive about Life and am inspired to continue with a much healthier lifestyle.